قرآنی, سید فرامرز, بارانی, صمد. (1394). تدوین معیار کمی ارزیابی چابکی حاصل از عملکرد. مطالعات منابع انسانی, 5(18), 1-30. سید فرامرز قرآنی; صمد بارانی. "تدوین معیار کمی ارزیابی چابکی حاصل از عملکرد". 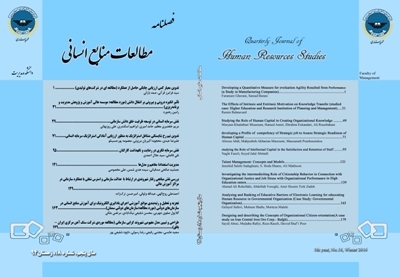 مطالعات منابع انسانی, 5, 18, 1394, 1-30. قرآنی, سید فرامرز, بارانی, صمد. (1394). 'تدوین معیار کمی ارزیابی چابکی حاصل از عملکرد', مطالعات منابع انسانی, 5(18), pp. 1-30. قرآنی, سید فرامرز, بارانی, صمد. تدوین معیار کمی ارزیابی چابکی حاصل از عملکرد. مطالعات منابع انسانی, 1394; 5(18): 1-30. عضو هیات علمی دانشگاه هوایی شهید ستاری، تهران، ایران. توجه به معیار کمی عملکرد چابکی فراتر از ویژگی‌های ساختاری یا عملیاتی، یک رویکرد جدید می‌باشد. نتیجه‌گیری با شاخص عملکرد کمی، که مطابقت نزدیکی با تعریف نظری چابکی دارد، قابلیت کاربرد در انواع سازمان‌های تولیدی را داشته، و می‌تواند برای مقایسه بین تولیدکنندگان در صنایع مختلف مورد استفاده قرار گرفته، و به طور خودکار در طول زمان موفقیت نسبی در صنایع مربوطه را به صورت به هنگام و به روز حاصل نماید. این تحقیق، به دنبال یک معیار کمی و عینی برای چابکی عملکرد می‌باشد تا چابکی را به عنوان نتیجه‌ای از یک عملکرد مورد ارزیابی قرار داده و بر هر دو مورد موفقیت سازمانی و اغتشاش محیطی فائق آید و قابل کاربرد در تمام انواع سازمان‌های تولیدی نیز باشد. معیار چابکی عملکرد، از طریق ایجاد یک مدل نظری شروع و سپس از طریق مرور ادبیات، مطالعات موردی، و پیمایش آزمایشی داده، عملیاتی می‌گردد و متعاقب آن، در قالب یک کانال تخصصی، به پاسخ‌های خود می‌رسد . معیار چابکی عملکرد، با استفاده از داده‌هایی که از چهار شرکت تولیدی جمع آوری شده، نشان داده می‌شود، که نمایانگر 4 ترکیب ممکن از موفقیت و اغتشاشات است و با مدل نظری سازگار بوده، و گواهی عملی از شرکت‌های مورد مطالعه می‌باشد. برای اعتبار سنجی آتی این معیارها، ضروری است که ارزیابی پایایی و روایی در این زمینه انجام پذیرد. این رویکرد می‌تواند از طریق مدیران تولید برای حصول به یک "تصویری کلی" از سطح چابکی عملکرد یک سازمان، و برای ملاحظه سیستماتیک اثرات عوامل محیطی مورد استفاده قرار گیرد. زندحسامی، حسام و رجب­زاده، علی و طلوعی، عباس (1388)، بررسی مؤلفه­های تأثیرگذار بر زنجیره تأمین چابک (PSCM) و طراحی مدل مفهومی مدیریت زنجیره تأمین چابک، فصلنامه پژوهش نامه بازرگانی، شماره 51، صص 161-123. کزازی، ابوالفضل و سهرابی، روح الله (1389)، ارایه مولفه ها و شاخص های ارزیابی چابکی زنجیره تامین شرکت ملی نفت ایران (مورد مطالعه: شرکت مناطق نفتخیز جنوب)، پژوهش نامه مدیریت تحول ، سال 2، شماره 4، صص 165-142. Agarwal, A., Shankar, R. and Tiwari, M.K. (2007), “Modeling agility of supply chain”, Industrial Marketing Management, Vol. 36 No. 4, pp. 443-57. Barimchai, M., Zimmers, E.W. Jr and Marangos, C.A. (2006), “A comprehensive framework for evaluating suppliers’ agile performance”, International Journal of Agile Manufacturing,Vol. 9 No. 2, pp. 37-51. MeasuringAgility Caswell, N.S. and Nigam, A. (2005), “Agility = change + coordination”, Proceedings of the 2005Seventh IEEE International Conference on E Commerce Technology Workshops, Munich,Germany. Christian, I., Ismail, H., Mooney, J., Snowden, S., Toward, M. and Zhang, D. (2001), “Agile manufacturing transitional strategies”, Proceedings of the Fourth SMESME International Conference, Aalborg, Denmark, pp. 69-77. Demeter, K. and Kolos, K. (2009), “Marketing, manufacturing and logistics: an empirical examination of their joint effect on company performance”, International Journal of Manufacturing Technology and Management, Vol. 16 No. 3, pp. 215-33. Dove, R. (1995), “Measuring agility: the toll of turmoil”, Production Magazine, Vol. 107 No. 1,pp. 12-14. Dove, R. (2001), Response Ability: The Language, Structure, and Culture of the Agile Enterprise,Wiley, New York, NY. Drickhamer, D. (2004), “Tick tock: IW/MPI census of manufacturers shows challenges, realityand, yes, even optimism”, Industry Week, January, available at: www.industryweek.com/ReadArticle.aspx?ArticleID=1365 (accessed 18 August 2008). Duncan, R.B. (1972), “Characteristics of organizational environments and perceived environmental uncertainty”, Administrative Science Quarterly, Vol. 17, pp. 313-27. Dwyer, F.R. and Welsh, M.A. (1985), “Environmental relationships of the internal political economy of marketing channels”, Journal of Marketing Research, Vol. 22 No. 4, pp. 397 414. Emery, F.E. and Trist, E.L. (1965), “The causal texture of organizational environments”, HumanRelations, Vol. 18, pp. 21-32. Giachetti, R.E., Martinez, L.D., Saenz, O.A. and Chen, C.S. (2003), “Analysis of the structuralmeasures of ﬂexibility and agility using a measurement theoretical framework”, International Journal of Production Economics, Vol. 86 No. 1, pp. 47-62. Gligor, D & Holcomb, M (2012). Understanding the role of logistics capabilities in achieving supply chain agility: a systematic literature review, Supply Chain Management: An International Journal, Vol, 17, No. 4, pp. 438–453. Goldman, S.L., Nagel, R.N. and Preiss, K (1995), Agile Competitors and Virtual Organizations –Strategies for Enriching the Customer, Van Nostrand Reinhold, London. HP (2005), “Measuring and benchmarking the agility of your business”, White Paper,available at: http://h71028.www7.hp.com/ERC/downloads/4AA0-1790ENW.pdf (accessed 15 August 2008). Ismail, H.S., Snowden, S.P., Poolton, J., Reid, I.R. and Arokiam, I.C. (2006), “Agile manufacturingframework and practice”, International Journal of Agile Systems and Management, Vol. 1No. 1, pp. 11-28. Ismail, H.S., Snowden, S.P., Vasilakis, G., Christian, I. and Toward, M. (2002), “A strategicframework for agility implementation”, Proceedings of the International ManufacturingLeaders Forum, Adelaide, Australia. Jaworski, B.J. and Kohli, A.K. (1993), “Market orientation: antecedents and consequences”,Journal of Marketing, Vol. 57 No. 3, pp. 53-70. Kara, S. and Kayis, B. (2004), “Manufacturing ﬂexibility and variability: an overview”, Journalof Manufacturing and Technology Management, Vol. 15 No. 6, pp. 466-78. Kettunen, Petri (2009). Adopting key lessons from agile manufacturing to agile software product development- A comparative study, Journal of Tec novation. Vol. 29, pp. 408-422. Klassen, R.D. and Whybark, D.C. (1999), “The impact of environmental technologies on manufacturing performance”, Academy of Management Journal, Vol. 42 No. 6, pp. 599-615. Vol. 21 No. 1, pp. 35-50. Kurian, T.J. (2006), “Agility metrics: a quantitative fuzzy based approach for measuring agility ofa software process”, Proceedings of the International Conference on Agile Manufacturing,Norfolk, VA.
Lawrence, P.R. and Lorsch, J.W. (1967), Organization and Environment: ManagingDifferentiation and Integration, Harvard Business School Press, Boston, MA. Lichtenthaler, U. (2009), “Absorptive capacity, environmental turbulence, and thecomplementarity of organizational learning processes”, Academy of ManagementJournal, Vol. 52 No. 4, pp. 822-46. Lomas, C.D.W., Wilkinson, J., Maropoulos, P.G. and Matthews, P.C. (2006), “Measuring designprocess agility for the single company product development process”, InternationalJournal of Agile Manufacturing, Vol. 9 No. 2, pp. 105-12. MacDufﬁe, J.P. (1995), “Human resource bundles and manufacturing performance:organizational logic and ﬂexible production systems in the world auto industry”,Industrial& Labor Relations Review, Vol. 48 No. 2, pp. 197-221. Maltz, A.C., Shenhar, A.J. and Reilly, R.R. (2003), “Beyond the balanced scorecard: reﬁning thesearch for organizational success measures”, Long Range Planning, Vol. 36, pp. 187-204. Miles, R.E. and Snow, C.C. (1978), Organizational Strategy, Structure and Process, McGraw-Hill,New York, NY. Milliken, F.J. (1987), “Three types of perceived uncertainty about the environment: state, effect,and response uncertainty”, Academy of Management Review, Vol. 12 No. 1, pp. 133-43. Overby, Eric; Bharadwaj, Anandhi& Sambamurthy, Vimer. (2006). Enterprise agility and the enabling role of information technology. European Journal of Information Systems, 15(2), 120-131. Schroeder, R.G., Bates, K.A. and Junttila, M.A. (2002), “A resource-based view of manufacturingstrategy and the relationship to manufacturing performance”, Strategic ManagementJournal, Vol. 23 No. 2, pp. 105-17. Shariﬁ, H. and Zhang, Z. (1999), “A methodology for achieving agility in manufacturing organizations”, International Journal of Production Economics, Vol. 62 Nos 1-2, pp. 7-22. Shariﬁ, H. and Zhang, Z. (2001), “Agile manufacturing in practice: application of a methodology”,International Journal of Operations & Production Management, Vol. 21 Nos 5/6, pp. 772-94. Shariﬁ, H., Ismail, H.S. and Reid, I. (2006), “Achieving agility in supply chain through simultaneous ‘design of’ and ‘design for’ supply chain”, Journal of Manufacturing Technology Management, Vol. 17 No. 8, pp. 1078-98. Sieger, D.B., Badiru, A. and Milatovic, M. (2000), “A metric for agility measurement in productdevelopment”, IIE Transactions, Vol. 32, pp. 637-45. Skinner, W. (1969), “Manufacturing – missing link in corporate strategy”, Harvard BusinessReview, Vol. 47 No. 3, pp. 136-45. Swafford, P.M., Ghosh, S. and Murthy, N.N. (2006), “A framework for assessing valuechain agility”, International Journal of Operations & Production Management, Vol. 26No. 2, pp. 118-40. Toward, M., Ismail, I., Christian, C. and Snowden, S. (2003), “Measures of agility: product-processresponsiveness”, in Tatsiopoulos, I. and Leopoulos, V. (Eds), Proceedings of the6th SMESME International Conference, Athens, pp. 323-33. Tsourveloudis, N.C. (2005), “Knowledge-based measurement of enterprise agility”, in Leondes, C.T (Ed. ), Intelligent Knowledge-Based Systems: Business and Technology ofthe New Millennium, Vol. 1, Kluwer Academic press, Norwell, MA, chapter 3, pp. 67-82. MeasuringagilityTsourveloudis, N.C. and Valavanis, K.P. (2002), “On the measurement of enterprise agility”,Journal of Intelligent and Robotic Systems, Vol. 33, pp. 329-42.
van Hoek, R.I., Harrison, A. and Christopher, M. (2001), “Measuring agile capabilities in thesupply chain”, International Journal of Operations & Production Management, Vol. 21No. 1, pp. 126-48. Volberda, H.W. and van Bruggen, G.H. (1997), “Environmental turbulence: a look into its dimensionality”, in Bemelmans, M.T.A. (Ed. ), Dynamiek in organisatie en bedrijfsvoering, NOBO, Enschede, pp. 137-46. Yauch, C.A. (2005), “Measuring agility: combining organizational success and environmentalturbulence”, International Journal of Agile Manufacturing, Vol. 8 No. 2, pp. 29-37. Yauch, C.A. and Navaresse, D.O. (2006), “Assessing agility at 70 manufacturing plants”,International Journal of Agile Manufacturing, Vol. 9 No. 2, pp. 19-28. Yusuf, Y.Y., Gunasekaran, A, Adeleye, E.O. and Sivayoganathan, K. (2004), “Agile supply chaincapabilities: determinants of competitive objectives”, European Journal of OperationalResearch, Vol. 159 No. 2, pp. 379-92. Zhang, Z. and Shariﬁ, H. (2000), “A methodology for achieving agility in manufacturingorganizations”, International Journal of Operations & Production Management, Vol. 20No. 4, pp. 496-513. Zhang, Z. and Shariﬁ, H. (2007), “Towards theory building in agile manufacturing strategy –a taxonomical approach”, IEEE Transactions on Engineering Management, Vol. 54 No. 2,pp. 351-70. Zsifkovits, H.E. and Engelhardt-Nowitzki, C. (2007) An analysis of frameworks for measuringsupply chain agility, in Matthews, P. (Ed. ), Proceedings of The IET InternationalConference on Agile Manufacturing, Durham, England, pp. 87-95.